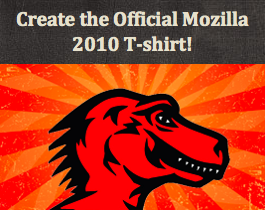 Home » Browser News » The Mozilla 2010 T-shirt Design Challenge! I’m excited to announce the latest challenge from the Creative Collective: designing the Mozilla 2010 t-shirt! The goal is to create a cool design that captures the unique essence of Mozilla, which would then be printed as the official Mozilla 2010 t-shirt and distributed as an exclusive item to contributors. Creating a design that represents the multi-faceted nature of Mozilla, its mission and its values is certainly no easy task, but we know that our amazing design community is up to the challenge. You might recall the last time that we gave our t-shirt design process an open-source flavor like this was with the Firefox 3 t-shirt contest, which resulted in thousands of submissions from around the world. Now, for the first time, we’re channeling the talents of our design community towards Mozilla (vs. Firefox), which makes this challenge particularly interesting and even more exciting. When designing, take inspiration from the broader themes that make Mozilla unique, such as: openness, community, and innovation. You can retain the bold, constructivist graphic style of the original artwork, or take a completely different direction. The possibilities are practically endless and we encourage you to take a more abstract approach, but please keep the Dino logo intact as indicated by our Trademark Policy. For additional details, considerations and requirements make sure to visit the design challenge page. And, remember that the submission period ends on April 30th 2010. So, get those creative juices flowing and send us your best stuff!